Having a whole lot of money and privileges doesn't mean you have fine qualities and a kind heart. That's a message we get in a classic film that's fun viewing for a New Year's Eve. 1938's HOLIDAY is one of the four films Cary Grant and Katharine Hepburn co-starred in together. 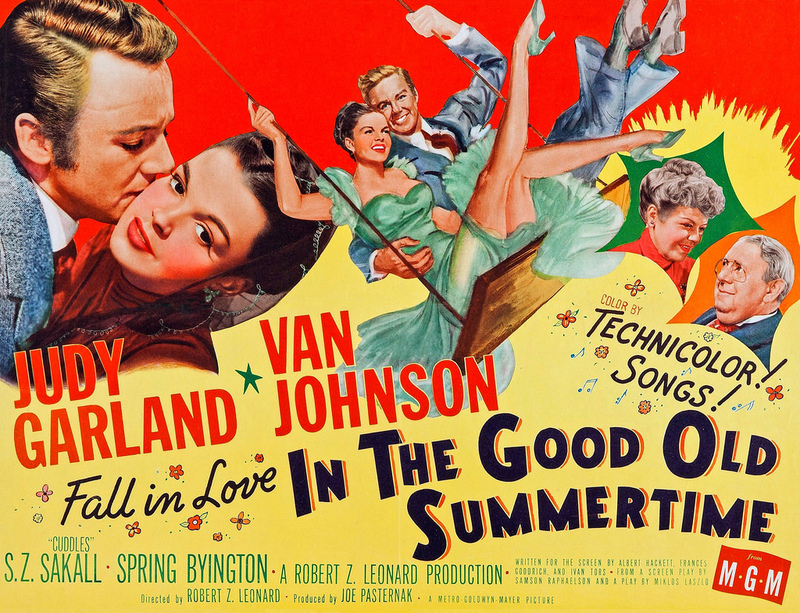 To me, it's one of director George Cukor's most-satisfying remakes along with GASLIGHT (1944) and A STAR IS BORN (1954). Like Cukor's famous THE PHILADELPHIA STORY (1940), also starring Grant and Hepburn, the HOLIDAY script is based on a play by Philip Barry. 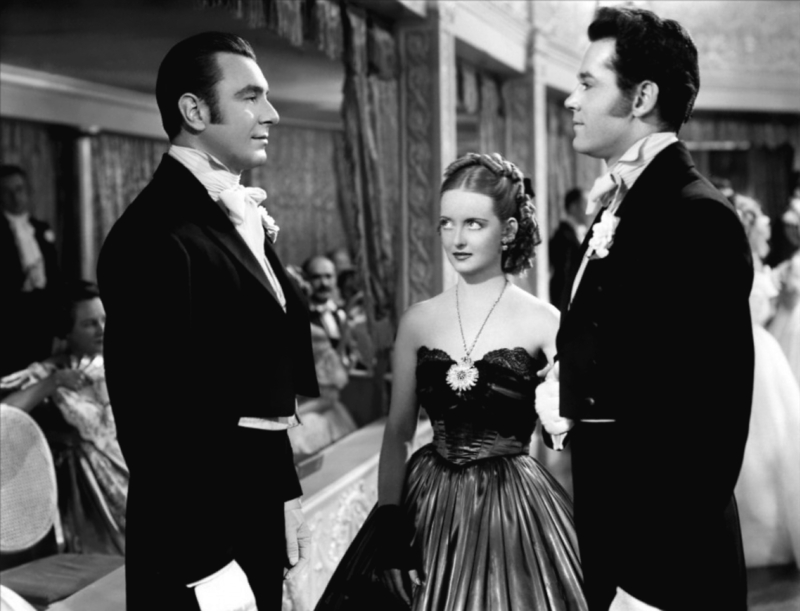 Cukor often showed the friction when different social classes bump up against each other in the same space -- like New Yorkers in a crowded subway car during rush hour. It's the Haves, the Have-Nots and Those Who Want. Like at Cukor's DINNER AT EIGHT (1933). He also showed the tension when one class member embraces a member of another class. That's seen in HOLIDAY. In that friction, in those embraces, we see characters who are forced to see people for what they are -- even if some of those heartbreaking realizations occur within one's own family. 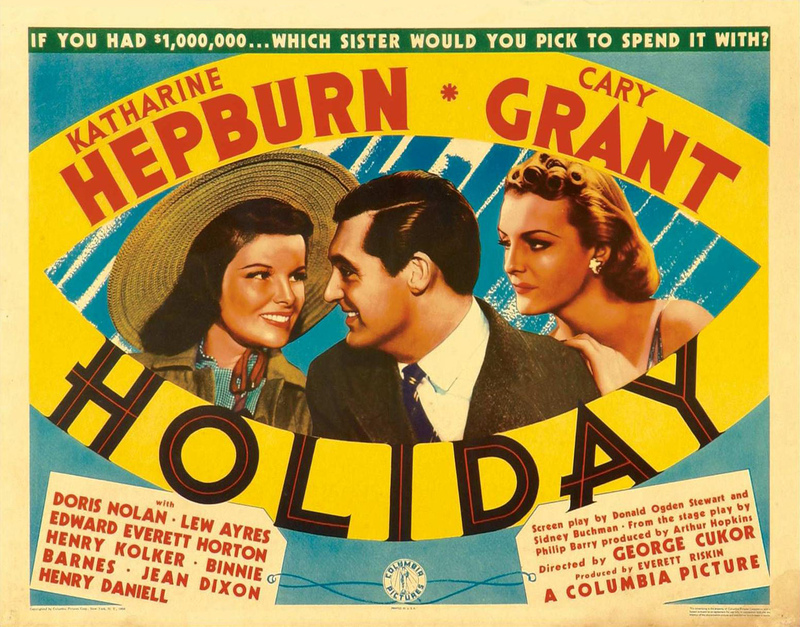 In HOLIDAY, Cary Grant is the smart, carefree, working class guy from a low income family who falls in love with a society lady born into wealth and privilege. He cares more about her and living a life not weighed down by possessions and obligations than he does about her wealth. They get engaged. When she brings him into her department store-sized house to meet the family, he learns that she's just like her stuffy father. She feel there's no greater thrill in the world than making money. Her name is Julia. But Julia's wonderful sister and brother, both happy that she's engaged, have a spirit more like Johnny's, the fiancé. 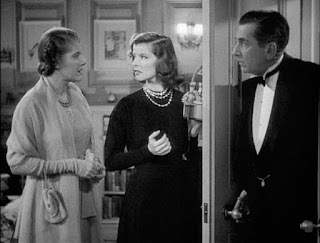 During a lot of action that takes place on New Year's Eve, we'll see that Linda, played by Katharine Hepburn, is starting to fall for Johnny against her will. 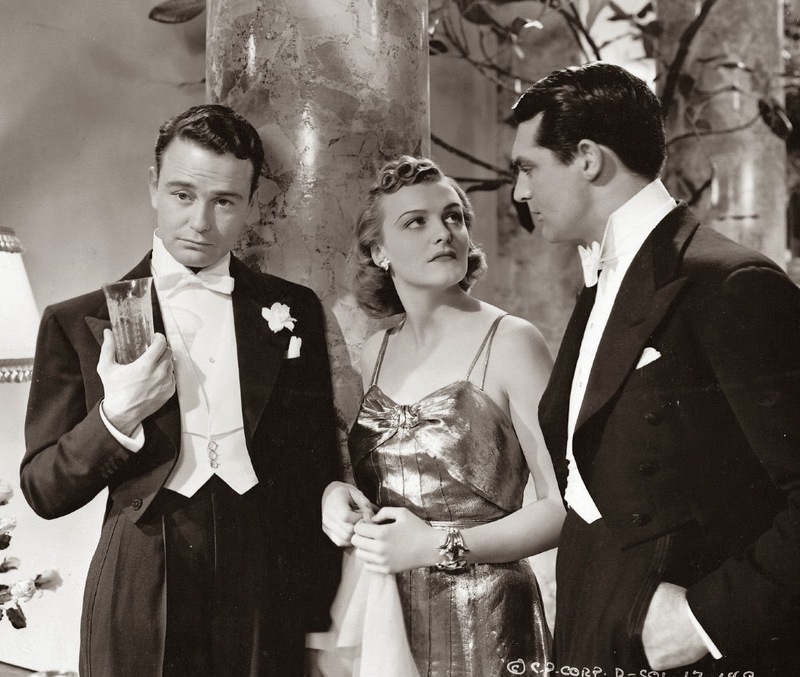 Linda and her brother Ned, poignantly played by Lew Ayres, are seen as wealthy and young social butterflies. Both are in a plaster cocoon of privilege's restrictions from which they want to break free. Julia will pin Johnny's wings down and make him fall in line to please her father and her. In today's world, Linda and Ned would understand why Colin Kaepernick took a knee on the NFL playing field. Julia and her father would feel the way Trump did. And they'd love to dine with him at Mar-A-Lago. Johnny and Linda will both feel the need to break away from the upper class Seton Family. The more I see this movie, the more I love the performance Lew Ayres gives as Ned, the loving and heartbroken brother who drinks too much. It's such a beautifully understated, touching performance. Ayres doesn't show you drunkenness. He brings you into Ned's wounded hurt to feel why he drinks. He gives you a sense of a boyish optimism that was steadily beaten down by his bully father. We sense that in Ned, now the weary young talented man who deadens the pan with a drink. 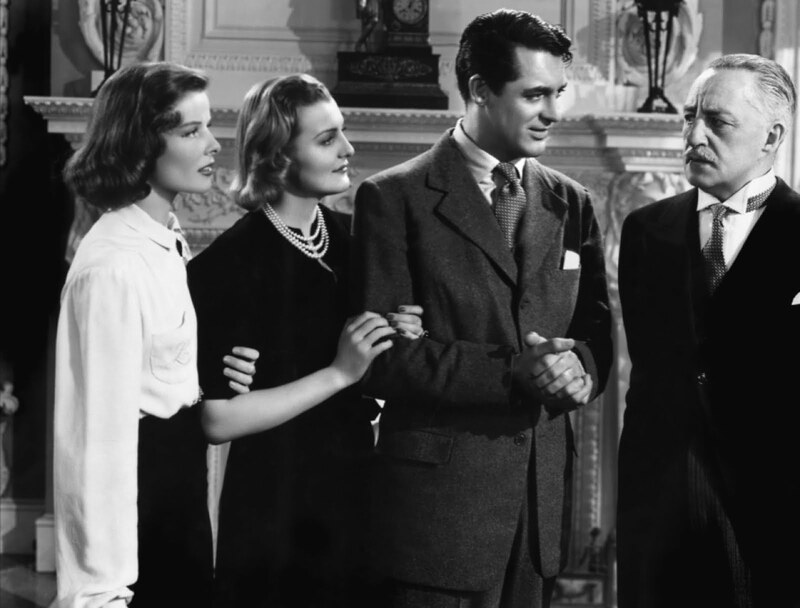 Cukor's HOLIDAY should have brought Lew Ayres an Oscar nomination for Best Supporting Actor. Johnny has two absolutely delightful, down-to-earth friends. A middle-aged married couple. The Potters. They come to his New Year's Eve engagement party and soon see that Linda is the right one for him. Not Julia. 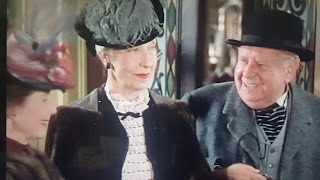 Nick and Susan Potter are played by the always dependable Edward Everett Horton and Jean Dixon. OK, I'm going to admit something. For quite a few years now, I've wished I could be in another remake of HOLIDAY. One with a nod to modern times. I'd like The Potters to be a middle-aged gay married couple and I'd be the new version of the Mrs. Potter character. 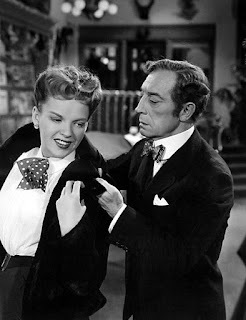 I love her in Cukor's HOLIDAY. 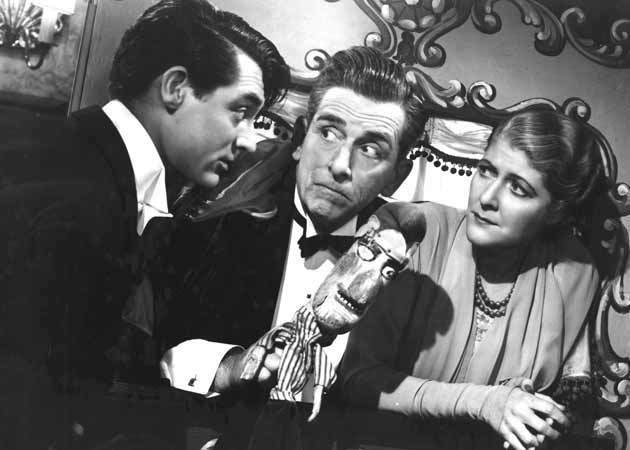 Here's some classic film trivia for you: Edward Everett Horton was one of those rare actors who played the same role in the original and a remake. 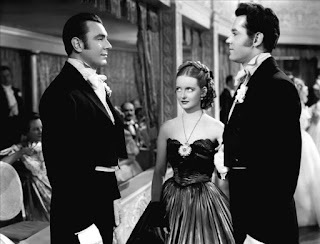 He's Nick in the somewhat wooden 1930 adaptation of HOLIDAY starring Ann Harding and Mary Astor as the wealthy sisters. 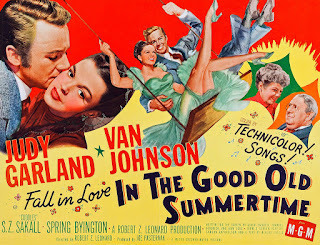 Here's some more classic movie trivia for you: Did you know that the MGM musical comedy IN THE GOOD OLD SUMMERTIME, a 1949 hit starring Judy Garland and Van Johnson, has a 2-cast member connection to Billy Wilder's 1950s classic drama, SUNSET BOULEVARD? 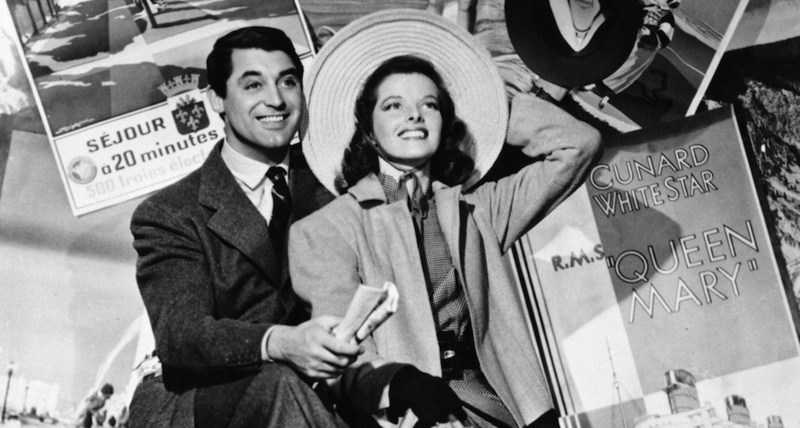 This is a musical remake of MGM's 1940 romantic comedy, THE SHOP AROUND THE CORNER. The action has changed from Budapest to Chicago. Garland and Johnson are the bickering music shop co-workers who have no idea they're secretly romantic pen pals in a series of letter that don't contain their names. Just post office box numbers. Silent screen great Buster Keaton plays one of the shop's other employees opposite Van Johnson and Judy Garland. There's a brief scene outside the music shop with a couple of women. One verbally recognizes the owner as he subtly tries to push a harp sale. He pretends to be an anonymous person who's stunned at the store's bargain prices. The tall lady who's hip to his merchant tactics is played by Anna Q. Nilsson. Like Keaton, she was also a silent screen star. That's another film classic with a New Year's Eve party scene. Norma Desmond starts the New Year off with a kiss. I hope you can do the same. Happy New Year...and may 2018 have all the happiness that may have eluded you in 2017. I don't mean to sound vain, but NPR's WEEKEND EDITION could've used my help as a segment producer today. There needed to be more information related to a Cary Grant classic movie. The classic movie, a love story that starts with a luxury liner flirtation, is a glossy and colorful Hollywood remake that floats on star power. It has the high wattage screen star power of Cary Grant with the superb Deborah Kerr. This love story remake was so popular that it was referenced in two future movies. 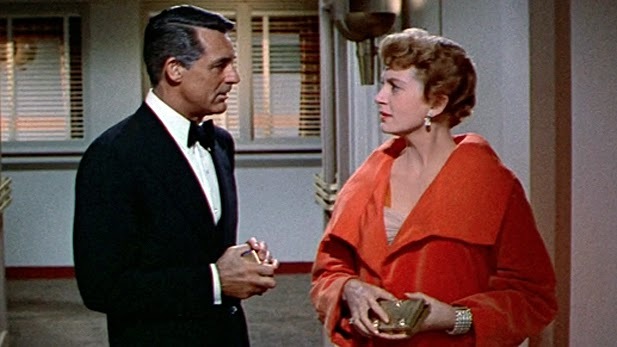 In one of them, three women worship Cary Grant and Deborah Kerr in 1957's AN AFFAIR TO REMEMBER. Those women are in SLEEPLESS IN SEATTLE, the big Tom Hanks and Meg Ryan romantic comedy hit of 1993. I kick off my early Saturday mornings with coffee and the voice of Scott Simon, the outstanding Saturday host of WEEKEND EDITION on NPR. I really love his new feature, "Movies You Missed." Classic films are my passion. Scott has a younger member of the NPR family watch a classic film for the first time and then review it. They compare notes. It makes for lively talk. One millennial had no idea how many lines he's heard in pop culture originated in CASABLANCA. The talk about what THE COLOR PURPLE meant to a new viewer's life was truly touching. Linda Wertheimer sat in today for the vacationing Scott Simon. I would've asked the millennial guest if he'd ever seen SLEEPLESS IN SEATTLE. I would've told him that the characters Meg Ryan, Rosie O'Donnell and Rita Wilson play talk about this Cary Grant film extensively. The Ryan and O'Donnell characters even watch it on TV together. I would've also told him that AN AFFAIR TO REMEMBER is the reason why SLEEPLESS IN SEATTLE ends with a scene at the Empire State Building. In the WEEKEND EDITION "Movies You Missed" segment, there was no mention of SLEEPLESS IN SEATTLE which not only has patches of dialogue about AN AFFAIR TO REMEMBER, but you hear the 1957 movie's theme music in the soundtrack. 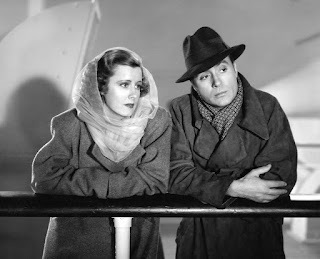 I would've told host Linda Wertheimer that AN AFFAIR TO REMEMBER was a successful remake of the 1939 classic, LOVE AFFAIR, starring Charles Boyer and Irene Dunne. Leo McCarey directed the 1939 original, which was nominated for Best Picture, and he also directed the remake. In the WEEKEND EDITION "Movies You Missed" segment, there was no mention that AN AFFAIR TO REMEMBER is a remake of LOVE AFFAIR. The millennial guest watched AN AFFAIR TO REMEMBER on his laptop during a flight. He didn't quite seem to dig Cary Grant and didn't seem to be aware that Grant was a huge Hollywood star at the time. I would've asked him on the air if he'd ever seen Cary Grant in Hitchcock's NORTH BY NORTHWEST and NOTORIOUS, two of Hitchcock's best. I know millennials in New York City who've seen NORTH BY NORTHWEST and wish they could be as cool as Cary Grant in that thriller. Years before SLEEPLESS IN SEATTLE, there was 20th Century Fox drama in which a young married couple in Los Angeles watch AN AFFAIR TO REMEMBER on TV and quote dialogue along with the stars it in, just like Meg Ryan and O'Donnell did in SLEEPLESS IN SEATTLE. The Fox drama is 1982's MAKING LOVE starring Kate Jackson and Michael Ontkean as the sweet couple. This was a groundbreaking Hollywood film about a married man who makes the decision to be fully honest with his wife and come out of the closet. 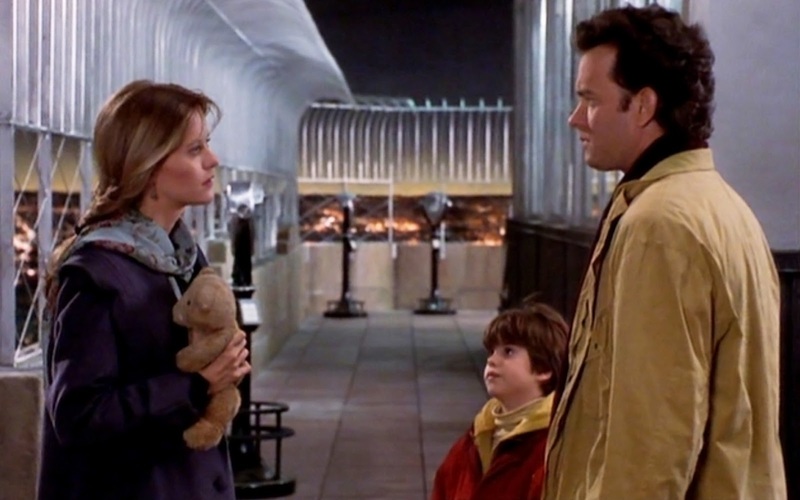 Rita Wilson (Mrs. Tom Hanks) has a memorable scene in SLEEPLESS IN SEATTLE as the wife who explains to her husband and their widower dad friend (Hanks) why AN AFFAIR TO REMEMBER is so special. She tears up explaining how tragedy strikes in the movie. My mother was never one for watching daytime TV much when I was a kid. But there were rare occasions during my elementary school summer vacations when Mom would stop and watch certain old movies on afternoon local TV. One was AN AFFAIR TO REMEMBER. It seemed to have a hypnotic pull on her. 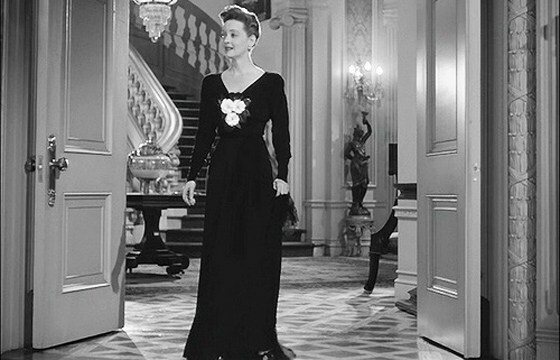 I recall walking into the living room during a final scene with Deborah Kerr stretched out on a couch in a low-rent apartment. Her legs covered up by a blanket. Mom was in tears. I asked her what was wrong. She did exactly what Rita Wilson does in SLEEPLESS IN SEATTLE. I had the same expression on my face that the little boy has in that clip with Rita Wilson. When I attended a preview screening of SLEEPLESS IN SEATTLE in 1993 and that scene came on, my first thought -- as I laughed a lot -- was "Director Nora Ephron is brilliant. I personally have lived this scene." By the way, I know that AN AFFAIR TO REMEMBER is quite popular with film fans of a certain age...and, man, do I dig Cary Grant. But, I prefer the 1939 original, LOVE AFFAIR. Irene Dunne, a singer and an actress, is at her sophisticated peak in that film. As in the original, Deborah Kerr is a classy nightclub singer in AN AFFAIR TO REMEMBER but her singing is dubbed, as it was in THE KING AND I, by Marni Nixon. 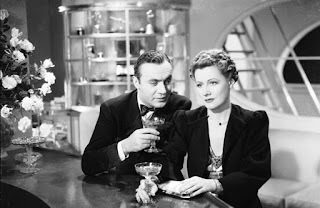 Irene Dunne did her own singing in LOVE AFFAIR and she had better songs -- songs that revealed character and moved the action forward. 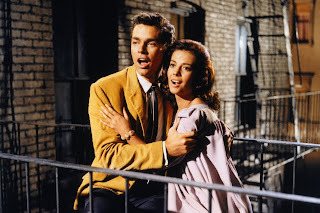 The songs in AN AFFAIR TO REMEMBER are schmaltzy. After AN AFFAIR TO REMEMBER, LOVE AFFAIR was remade yet again -- and with its original title. 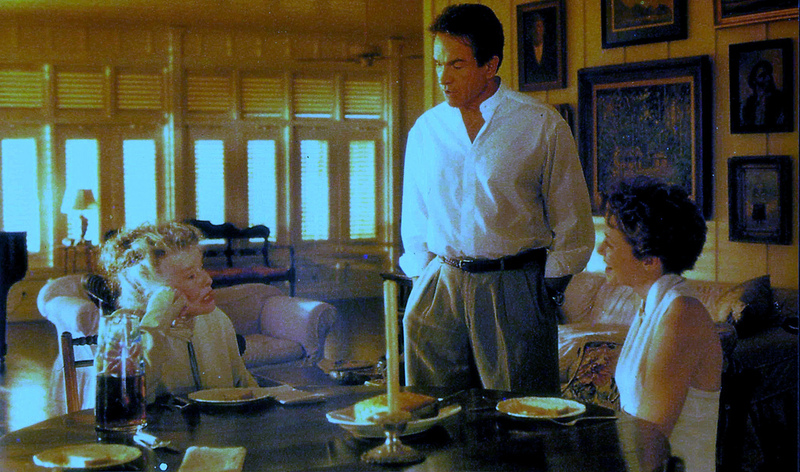 1994's LOVE AFFAIR starred Warren Beatty, Annette Bening and, in her last big screen appearance, Katharine Hepburn. This wasn't mentioned in the WEEKEND EDITION segment either. There you have it. My notes on AN AFFAIR TO REMEMBER and SLEEPLESS IN SEATTLE. Tell NPR to contact me if it needs segment producers. I need a job. 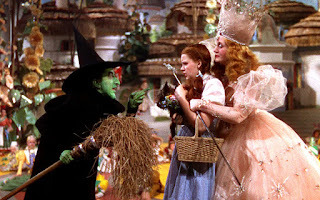 To hear the "Movies Your Missed" segment on Saturday's WEEKEND EDITION, you can find it here: www.NPR.org. Click onto the Programs and Podcasts section, then look for Weekend Edition Saturday. When this movie ends, you will wish to be in someone's arms at that very moment. I know I did. If I was asked to contribute my list of the Top Ten films I've seen this year, CALL ME BY YOUR NAME would be on the list. 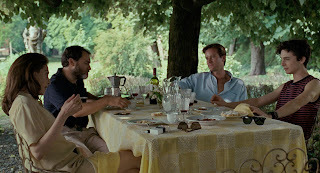 Based on a 2007 novel of the same name, this film, occasionally subtitled, was directed gracefully by Luca Guadagnino. The story takes place in the Northern Italian countryside in the summer of 1983. It is so deeply, beautifully sensuous and touching. It's a story about the discovery, joy and heartache of first love. We follow two males. When I started reading terrific reviews about this film months ago, some initial headlines summed it up as an older man falling for a younger male. Those summaries were misleading. This isn't DEATH IN VENICE. It's not like Woody Allen films with a 40 year old guy dating a girl who's in high school. Actor Timothée Chalamet plays the 17 year old Jewish American kid living with his totally cool parents. What an excellent performance he delivers as Elio! Elio's father is an archaeology professor who invites a graduate student to live with his family for the summer. The student, Oliver, helps the professor with academic writing and research. A 17 year old bookworm and a grad student. That's not a May-December relationship. Armie Hammer plays the handsome, responsible, friendly and forthright grad student who's a good fit in the professor's warm villa. I kept watching Hammer and tried to think of what other movie I knew him from. The next day, it came to me. He was the lead in the unsuccessful movie version of THE LONE RANGER that with Johnny Depp as Tonto. CALL ME BY YOUR NAME shakes off that flop. Hammer also delivers an excellent performance. The two actors bond and blend so well. Their acting shines with spontaneity and truth. Elio may be a bookworm with a skill for playing classical piano, but he's also a typical teen in many ways as we see when he's hanging out with other teens. That's very refreshing. He's not a highbrow outsider. He's a 17 year old guy whose body is awkwardly starting to express sexual awareness and romantic feelings. There's a gangling eroticism about his coming-of-age. With insecurity and a few wisecracks, he sets out to seduce Oliver. Oliver responds with discipline, humor and tenderness. If you saw THE SHAPE OF THINGS, there's a government scientist in that sci-fi fantasy who speaks Russian. He's played by actor Michael Stuhlbarg. He plays Elio's loving, bearded teddy bear of a Jewish father in this romantic drama. 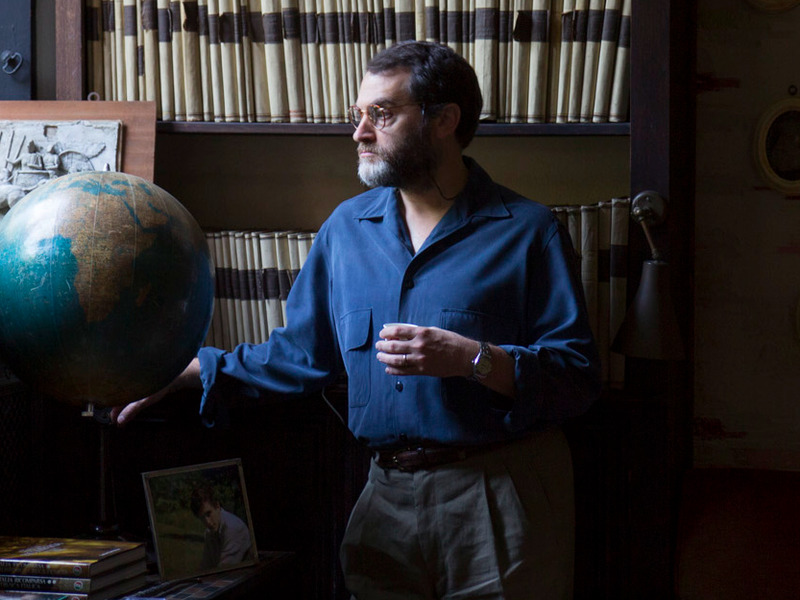 I truly, madly, deeply hope Michael Stuhlbarg gets a Best Supporting Actor Oscar nomination for his performance in CALL ME BY YOUR NAME. I fell in love with the wise dad. You must stay through the final shot of the closing credits. You must. There's remarkable acting in it. When that shot is over and the closing credits come to a conclusion, we see that CALL ME BY YOUR NAME is dedicated to a popular actor/director we lost this year -- the talented Bill Paxton of the movies ALIENS, TWISTER and the HBO series, BIG LOVE. Have a great weekend. Spend time with someone who loves you and Happy New Year. I'm gonna treat myself to some ice cream. Peach-flavored. Here's a tip on a movie musical that airs tonight on TCM (Turner Classic Movies). It stars a woman who's the reason why I turned down TV work with Geraldo Rivera. The musical is one of those old Hollywood movies that was delightfully lampooned in one of the old movie take-offs we came to love so much on THE CAROL BURNETT SHOW. I belly laughed out how accurately Carol Burnett recreated a hospital love scene that immediately follows the scene in which the leading lady in is a serious car crash on a country road -- but survived it without getting a single smudge on her designer gown. The movie is THE DOLLY SISTERS with Betty Grable, a major Hollywood musical comedy star. In 1953's HOW TO MARRY A MILLIONAIRE, a popular comedy with a plot that she'd done in her earlier movies, Betty Grable played Loco, the model who loved to eat. Lauren Bacall (left) and Marilyn Monroe (right) co-starred. 20th Century Fox became famous as the studio of "The Fox Blondes" who were mostly featured in deluxe musicals. From singer Alice Faye in the 1930s and ice skater Sonja Henie to musicals starring Marilyn Monroe in the 1950s, Fox had a thing for blondes. 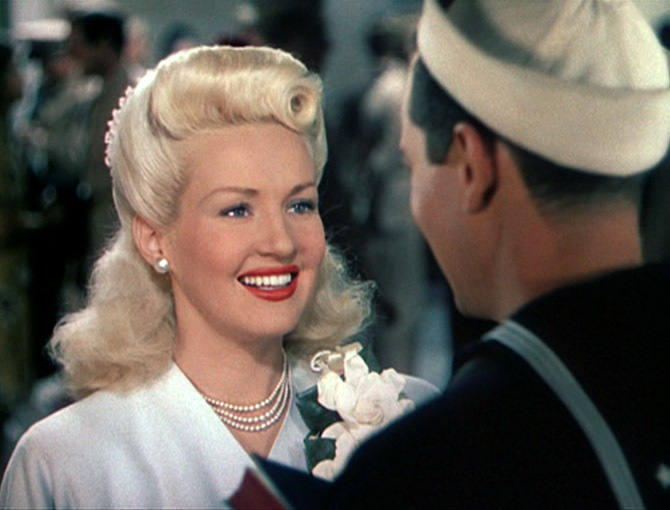 Betty Grable was the studio's hottest blonde of the 1940s. She could sing and dance. In the 1930s, just like Lucille Ball, Grable was seen in bit parts in Fred Astaire and Ginger Rogers RKO musicals. By 1940, Grable was a new Fox star and by 1943, she was a top Hollywood box office star and one of Hollywood's highest paid women. Plus, she was a top, truly iconic pin-up for soldiers during World War 2. Her legs were famous and she was glad to show 'em off in her movies. Her musical comedies often seemed to have similar plots, but the audiences apparently didn't care. They were feel-good movies and Betty had a snappy, warm personality that moviegoers loved. THE DOLLY SISTERS, a loosely-based show biz biopic, was one of her biggest Fox hits. In a current podcast, I tell Keith Price, my partner and producer, about a new documentary on Netflix. 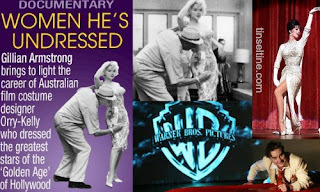 It's about the amazing, creative and innovative Hollywood costumer designer named Orry-Kelly. Betty Grable rarely looked better in a Technicolor musical than she did wearing Orry-Kelly creations in 1945's THE DOLLY SISTERS. 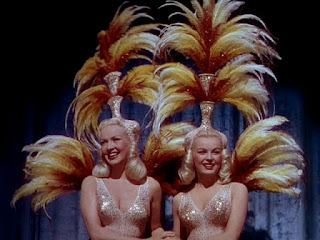 The other sister is played by blonde June Haver (right). WARNING: This is one of those 1940s Hollywood musicals that has a blackface production number. So be prepared. On a personal note, I love TCM. I have since 1999 when I started watching. I love that I can see old films uncut and commercial free and I understand that Hollywood, for all its faults, is more enlightened about racial images today than it was then. However, as a person of color, it does get frustrating when I see more blackface numbers in old movies presented than I see African-American hosts or guest co-hosts throughout a year in segments on TCM. This year was no exception. Betty Grable was one of those stars from Hollywood's Golden Era who got to be a guest and have fun on THE CAROL BURNETT SHOW. And, yes, her legs still looked great. 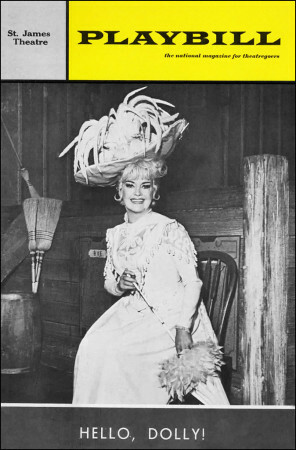 In the 1960s, Betty Grable did TV commercials and had Broadway success when she went into the HELLO, DOLLY! starring role. In the late 80s and into the 90s, Geraldo Rivera had a daytime TV show. His show contacted me a few times after my VH1 years to come on and do celebrity gossip. I politely turned down the offers. Why? Because of something I heard about Betty Grable. When I was a kid and very young classic film fan growing up in Los Angeles, I also read the entertainment columns in the newspapers. Joyce Haber was the powerful entertainment news/gossip columnist for THE LOS ANGELES TIMES who followed Hedda Hopper. Haber could be downright bitchy in her column. Bitchy and hurtful. Betty Grable had been hospitalized. Columnist Joyce Haber, so the story goes, put a call in to one of her night-shift hospital contacts to find out what was ailing Grable. Haber was told allegedly, by the non-official source, that Betty Grable had lung cancer. It was prognosis negative. Haber printed the sad news that Betty Grable was terminally ill. The beloved movie star apparently read the news in the early morning edition before her doctors had been able to tell her in person. Joyce Haber was let go from THE LOS ANGELES TIMES. That L.A. story has stayed with me for years and that is why I wouldn't do celebrity gossip on TV. Betty Grable died of lung cancer in 1973 at age 56. Joyce Haber died in 1993. Betty Grable delights in THE DOLLY SISTERS on TCM tonight at 8p Eastern. 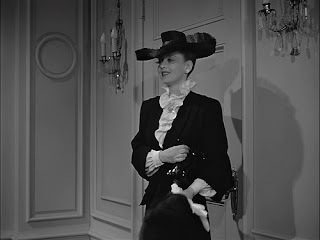 Go to my podcast to hear more about the film's costume designer, the openly gay and outspoken Orry-Kelly, and another film he contributed to, AUNTIE MAME: www.MOCHAA.podomatic.com. I've interviewed actor Michael Shannon a couple of times -- the two videos are posted on my YouTube page -- and, man, I sincerely hope I have the opportunity to talk to him again. He's an absolutely fascinating, no-frills guy. There's a lot of wit and wonder going on inside his head. I love talking to actors who have something to say, actors who become something special in their profession yet never lost that sense of common clay that they came from when they started their career journey. Michael Shannon plays a flat-out frightening racist who quotes the Bible in THE SHAPE OF WATER. He's in a position of power for a government operation. In Shannon's performance, he shows quick glimpses into the tainted soul of the character. We see that this man could change, he could turn his soul towards the light if he chose to. On Christmas Eve, Michael Shannon made me to a loud snort laugh as a good-hearted but slightly clueless small town shopkeeper named Maynard. If you're up for a quirky comedy that runs only about 90 minutes long, has a Christmastime feel and a spirited cast, check out the Michael Shannon comedy film on Netflix. It's called POTTERSVILLE. Yes, just like the town of George Bailey's Twilight Zone-like experience in Frank Capra's IT'S A WONDERFUL LIFE. 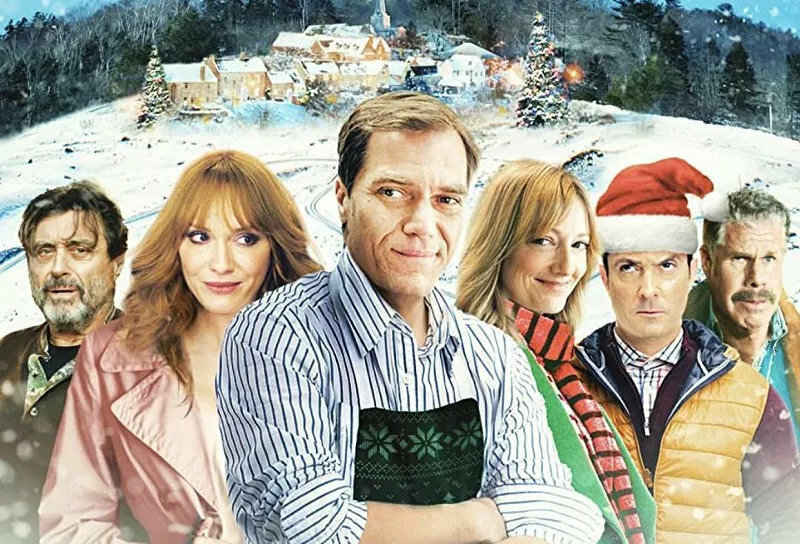 POTTERSVILLE is in color, with very appealing production design and a steady tone of humor that is often outrageous but doesn't go too over the top wacky and take away from the message of the piece. POTTERSVILLE is ultimately about giving people hope. It's the kind of project that, back in the early 90s, would have been a Hollywood studio release starring Bill Murray. A rural town, Pottersville, was hit with Recession Era layoffs. Folks are recovering but just getting by. They may run short of cash making purchases or may be a little late paying a bill. Maynard understands. He's got a good heart. But a relationship takes a sudden and unexpected disappointing turn. To recover, he gets a little drunk, puts on a gorilla costume and romps through the woods one night. Well...somehow, he's sighted and mistaken for the mysterious and legendary Bigfoot. Before you know it, the sighting has made news and a popular reality show host comes to town to get footage of Bigfoot in the woods for a major TV special. Maynard has been such a good friend and neighbor that he's sort of blended into the background. Residents have gotten used to his kindness and friendliness. They've forgotten how helpful he's been in their lives. Will they turn on him when it's discovered that he's really Bigfoot? I was really in the mood for something off-beat, harmless and short like this. POTTERSVILLE left me with a smile on my face. The cast includes Ron Perlman, Christina Hendricks (formerly of MAD MEN), Thomas Lennon (formerly of RENO 911!) and Ian McShane. McShane is the town macho hard drinker who uses the Bigfoot hunt to become like Quint, the Robert Shaw character in JAWS. Michael Shannon has two Oscar nominations to his credit for performances in dramas -- REVOLUTIONARY ROAD (2009) and NOCTURNAL ANIMALS (2017). 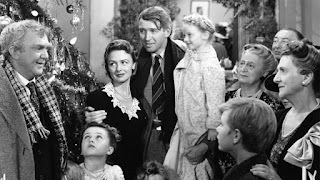 POTTERSVILLE may not be a great Christmas classic like IT'S A WONDERFUL LIFE or MIRACLE ON 34th STREET, THE BISHOP'S WIFE, WHITE CHRISTMAS or even A CHARLIE BROWN CHRISTMAS, but -- unlike DIE HARD -- no one gets killed, there's no gunfire, nothing gets blown up and the language is pretty clean. 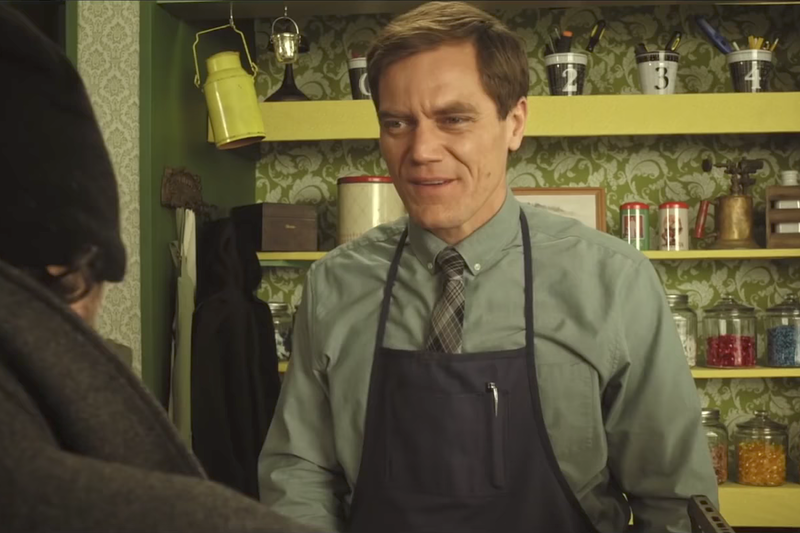 Also, it's good to be reminded that Michael Shannon is versatile and can also do comedy. You heard her silky voice sing at the open of Scorcese's 1974 film, ALICE DOESN'T LIVE HERE ANYMORE. You hear the silky voice of the 20th Century Fox musical star, Alice Faye, again in a new film. 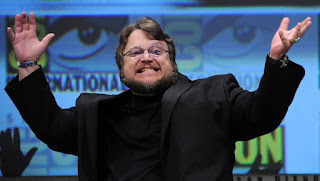 I just saw Guillermo del Toro's sci-fi fantasy thriller, THE SHAPE OF WATER. I'll talk about this film, for sure, in a podcast episode with my pal, Keith Price. I will tell you right here and now that I will not be surprised if there are Oscar nominations for actress Sally Hawkins and Octavia Spencer. What outstanding performances they give! I am such a fan of del Toro productions and this new one did not disappoint. Such imagination. Such creativity. Such surprise. Such a beautiful alien creature. Here's a trailer for the movie. 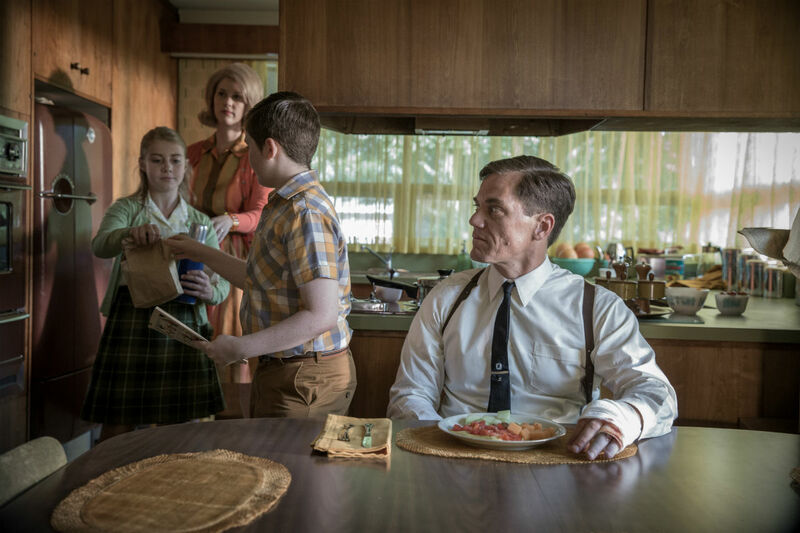 Michael Shannon and Richard Jenkins also star in it. Classic film fans may find it pretty cool to learn that a 1943 Fox musical in Technicolor contributes a very important item to THE SHAPE OF WATER. 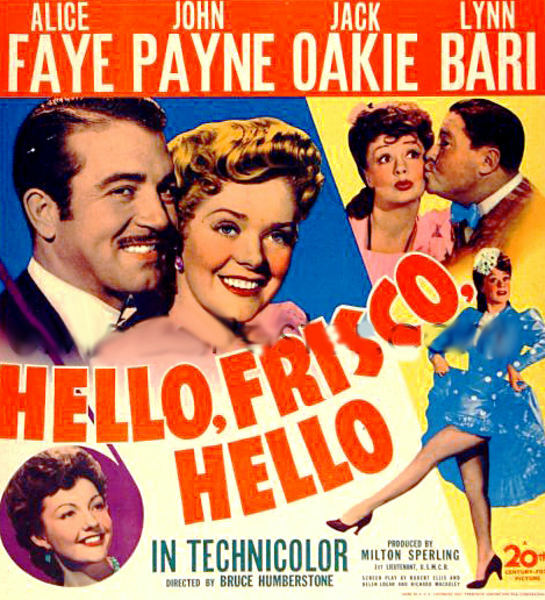 The musical is HELLO, FRISCO, HELLO and it starred Alice Faye. In that musical, she introduced the song "You'll Never Know." She was one of Fox's top blonde musical stars of the 1930s and into the 1940s. 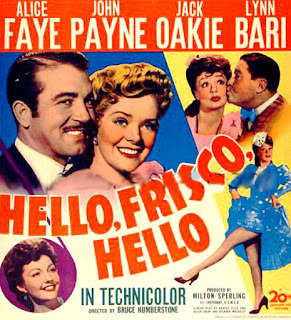 HELLO, FRISCO, HELLO came out during World War 2 and was a big hit with audiences. "You'll Never Know" won the Oscar for Best Song and became one of the singer's signature tunes. 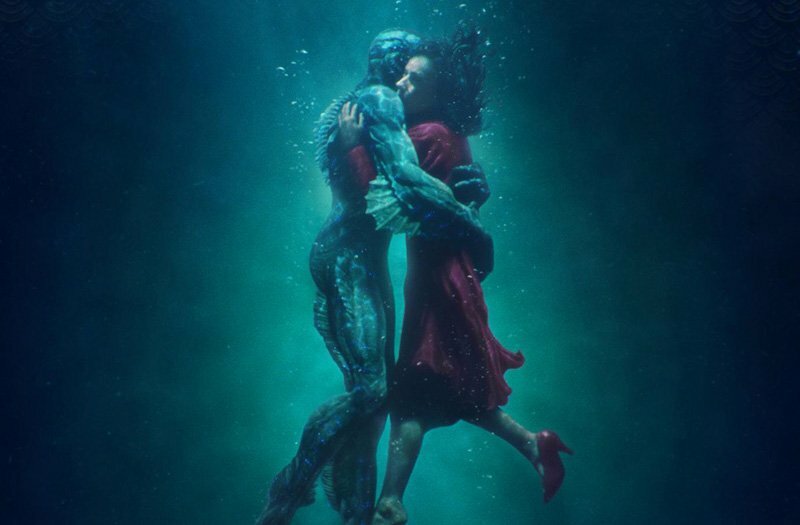 That song is important in THE SHAPE OF WATER. I'll explain, delve into the social relevance of this stunning sea creature sci-fi movie and tell you a little story about the lovely time I hung out with Alice Faye when I was new to New York City. All that's coming up on a future podcast. I would to interview "The Scare Bear" (my nickname for THE SHAPE OF WATER and PAN'S LABYRINTH director Guillermo del Toro) about his script and the choice of movie musical clips in THE SHAPE OF WATER. In the tale of the supernatural amphibian sea creature from South American, now in U.S. government custody, we see clips of classic Fox musicals starring Shirley Temple and Betty Grable. Like Alice Faye, they were also top stars at Fox. THE SHAPE OF WATER is a Fox Searchlight film. Did del Toro have a deal to direct/produce a new film for Fox? Warner Brothers has classic MGM musicals in its library. If he had made this film for Warner Bros. release, would they have paid to use those Fox clips or would he have had to switch to movie musical clips of MGM stars such as Judy Garland, Gene Kelly and Esther Williams? The old songs from movies are critical to revealing the sea creature's impact and powers. You know what might be a good film to watch before you go see THE SHAPE OF WATER if you don't plan to head out to the movie theater right away? GODS AND MONSTERS, the 1998 biopic that brought a Best Actor Oscar nomination to Ian McKellen. McKellen played James Whale, the British director in Hollywood who made revolutionary, popular box office movies yet had to recover from hitting a wall of Hollywood homophobia. He directed FRANKENSTEIN and BRIDE OF FRANKENSTEIN, two monster movies that changed the look and production game of monster movie-making. 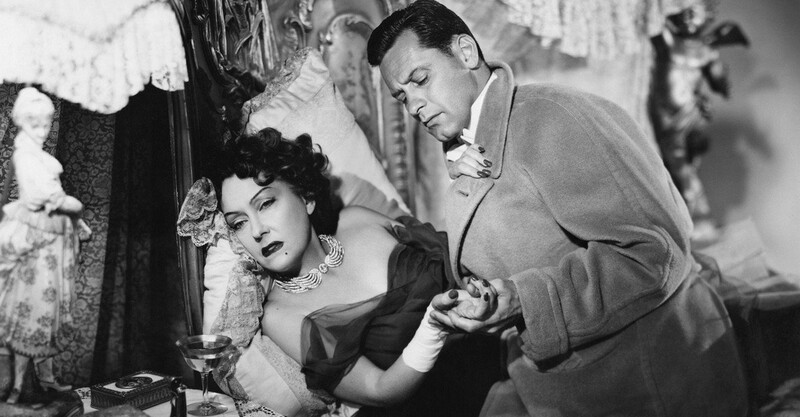 The director was openly gay at a time when Hollywood may have seemed liberal but was really quite conservative. At that time, it preferred its people to stay in the closet. Director/co-writer Guillermo del Toro told writer Chris Azzopardi in the December 17th post on www.intomore.com that he based the gay character that Richard Jenkins plays in THE SHAPE OF WATER on the late horror film director, James Whale. I'll talk more about that in the podcast too. In the meantime, please check out and *like* current episodes of our podcast at www.MOCHAA.podomatic.com. Merry Christmas! Happy Holidays! Wow. It seems like it was just yesterday when I was sweltering in the New York City summer heat while looking for a job. Now it's winter -- and I'm still looking for a job. The same goes for the enormously talented, charismatic, smart actor/comedian and podcast host, Keith Price. My friend Keith is the producer of the podcast that now allows me to talk about new movies, classic films, social issues and stuff like that there -- with a flair. Keith's also my partner at the microphone and he's fabulous on-air. We're just two heterosexually-challenged Black men taking about film, Broadway, TV and current affairs. This blog post will plug our current podcast episodes for the holiday season. 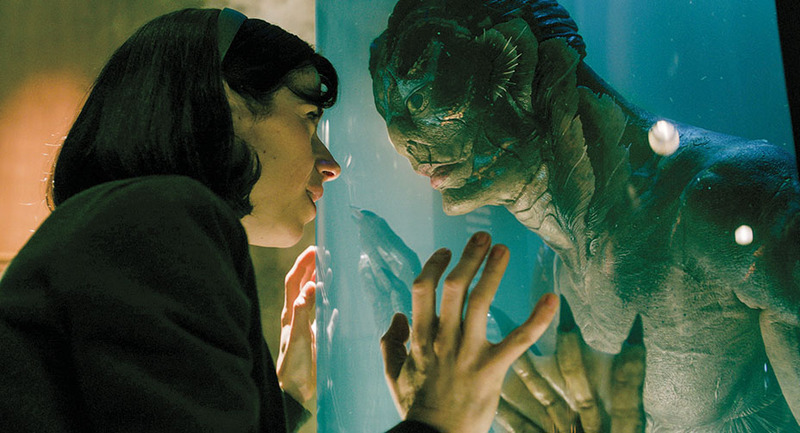 Have you read the reviews for THE SHAPE OF WATER? Wow. 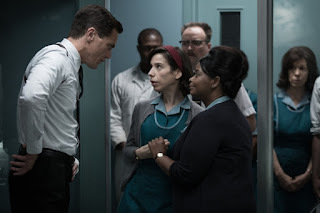 Excellent reviews for actresses Sally Hawkins and Octavia Spencer and for the film's director and co-writer, Guillermo del Toro. 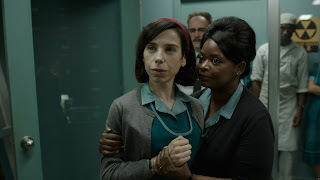 I think 2-time Best Supporting Actress nominee Octavia Spencer could make Oscar history in January when the nominations are announced. I explain how to Keith and I also tell him about the misinformed film review Rex Reed posted online. Twitter had a field day with that article before THE NEW YORK OBSERVER newspaper website deleted it. Rex was so wrong about THE SHAPE OF WATER. Did you ever see the 1950s Warner Brothers drama, THE BAD SEED? Young Patty McCormack repeated her Broadway role in the movie version. She plays a twisted sister of a schoolgirl. This little girl is a cold-blooded criminal who causes high drama with mama. 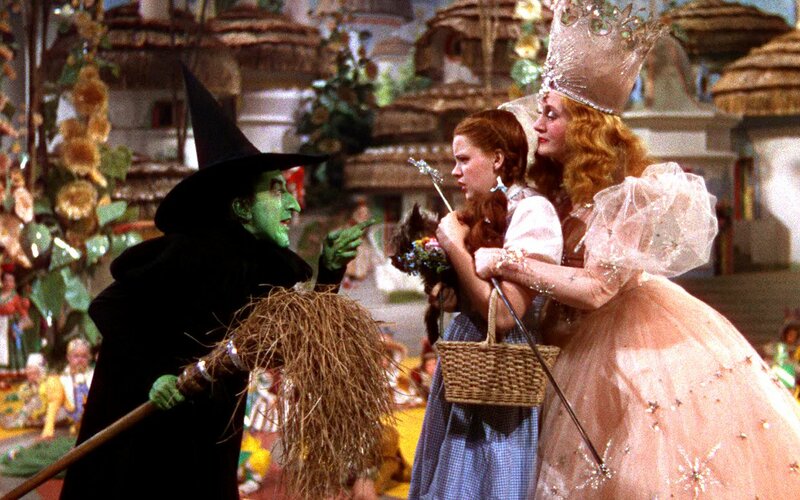 The movie version was directed by the man who produced the 1939 classic, THE WIZARD OF OZ. You should see that classic heartwarming musical before you see THE BAD SEED. Why? Because it influenced the new way I have of looking at the 1950s thriller. That 1950s thriller is being remade for Lifetime TV. I'll also talk about racial diversity in Frank Capra's IT'S A WONDERFUL LIFE, one of my favorite classic films to watch during the Christmas season. In an upcoming episode, I tell why the comedy AUNTIE MAME, starring Rosalind Russell, is perfect for holiday viewing nowadays and why it has a lot of contemporary relevance. I'll also recommend a Netflix documentary about the Oscar-winning costume designer Orry-Kelly. 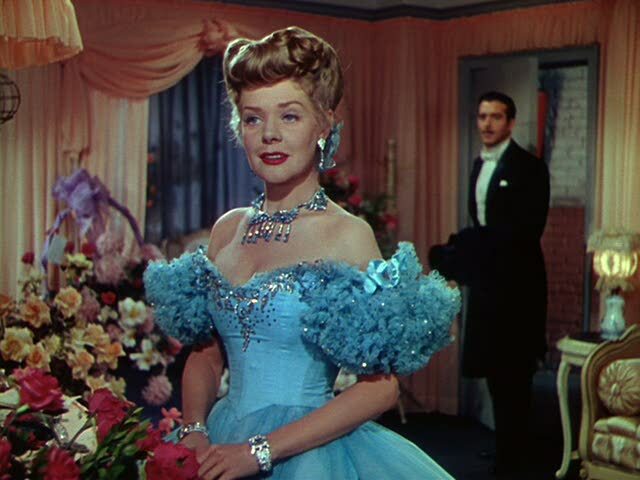 He designed Rosalind Russell's fabulous outfits in AUNTIE MAME. 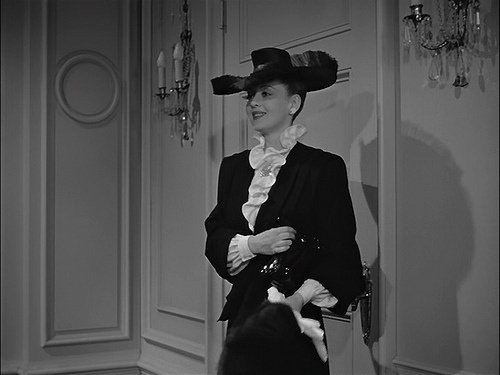 He also designed costumes for Bette Davis to wear as she gave some of her best Warner Brothers performances. Orry-Kelly designed dresses for Marilyn Monroe in SOME LIKE IT HOT that all looked like the sexiest lingerie ever created. Yummy! 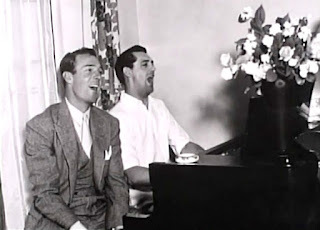 Orry-Kelly was also openly gay, had to deal with Hollywood homophobia and Hollywood studio politics and his roommate in New York City's Greenwich Village before they both relocated to pursue Hollywood dreams was an unknown British actor later known as Cary Grant. 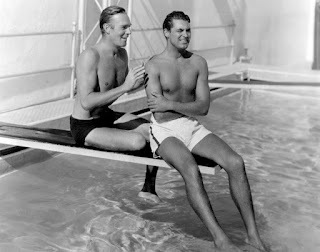 In Hollywood, Cary shared a bachelor home with fellow Hollywood newcomer Randolph Scott. After he'd achieved stardom that later rose to screen legend status, Grant had married a few women and become a proud papa. According to the doc, he was concerned when he heard that the top Hollywood costume designer had planned to write a memoir. WOMEN HE'S UNDRESSED is a fascinating, revealing documentary that not only lets you know more about the man but shows you the imagination, work and psychology that goes into creating costumes that add to the overall tone of a film and work for the talent wearing them. The sections about the long Orry-Kelly and Cary Grant friendship are quite something too. I hope you can give us a listen. Cheers! Here's a link: www.MOCHAA.podomatic.com.